A small boy was bathing in the river when a powerful storm came out of nowhere and washed him out to sea. 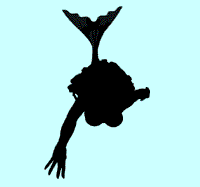 There he was found by a mermaid who took him to her home in the deepest part of the ocean. "Do you eat fish?" she asked. "Do you eat mutton or pork?" If the boy had answered yes to any of these questions the mermaid would have killed him because her body was made of fish, beef, mutton and pork. Since the boy had answered well the mermaid brought him to the surface and set him on the shore. After a while he was found by a shepherd who returned him to his family. Click this line to compare "African Myths: The Young Boy" to the Salmon Boy.